Hoover Fence Chain Link Kennel Panels w/ Gates - Light Grade - .065 Frame w/ 11-1/2 ga. Fabric | Hoover Fence Co. 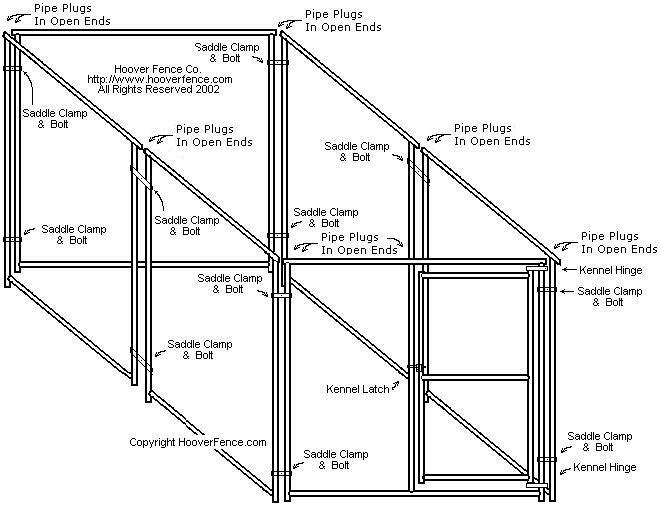 The residential light weight kennel will do the job adequately for most dogs and other animals. This is constructed with 1-3/8" outside diameter (O.D.) galvanized and welded frames (.065 wall thickness). Chain link mesh is 11-1/2 gauge (2-1/4" mesh). Galvanized clips and aluminum ties further secure the chain link fabric to the kennel frames, 18" on the top rail and 12" on the bottom rail. Gates are pre-hung utilizing tight-fitting kennel gate hinges and specially designed kennel latches. 4'H x 3'W 23 lbs. 5'H x 3'W 29 lbs. 6'H x 3'W 35 lbs. 4'H x 4'W 31 lbs. 5'H x 4'W 39 lbs. 6'H x 4'W 47 lbs. 4'H x 5'W 39 lbs. 5'H x 5'W 49 lbs. 6'H x 5'W 59 lbs. 4'H x 6'W 47 lbs. 5'H x 6'W 59 lbs. 6'H x 6'W 70 lbs. 4'H x 7'W 55 lbs. 5'H x 7'W 68 lbs. 6'H x 7'W 82 lbs. 4'H x 8'W 62 lbs. 5'H x 8'W 78 lbs. 6'H x 8'W 94 lbs.